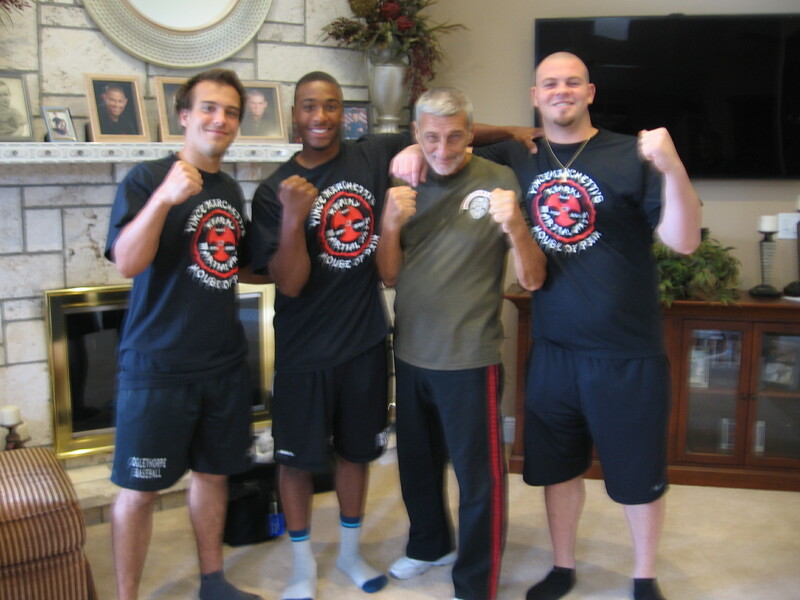 As anyone familiar with him can attest, Grandmaster Marchetti is always happy to instruct eager students in the martial arts. That is why when his friend Dr. Kulick asked him to take time out of his schedule to help his son and several others at the Kulick home, he agreed quickly. Aside from Dr. Kulick and Grandmaster Marchetti in attendance were Patrick Kulick, Spencer Transue and Vernon Trice – all three skilled athletes and college baseball players. From the pictures, it looks like everyone enjoyed the lesson and while hopefully these athletes will never need to defend themselves in the future they are much better prepared now if they remember and practice what they learned! 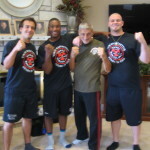 Patrick Kulick, Spencer Transue and Vernon Trice sporting their KMA t-shirts! Grandmaster Marchetti instructs a smiling Patrick Kulick. Grandmaster Marchetti demonstrating Ju-Jitsu during the lesson.